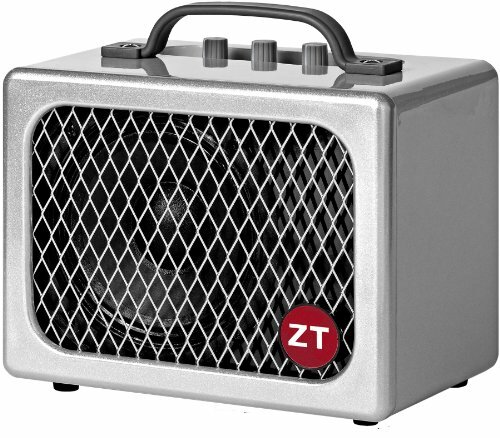 The ZT Amplifiers Lunchbox Junior is an incredible-sounding, pro-grade, mini portable guitar amp. This amp can be powered by a regular wall outlet or on the go with the ZT Battery Pack or Car Adapter Cable (each sold separately). It also has a 9V power output to drive your pedals! You can run your whole rig without an outlet in sight and still generate up to 117 dB, making this the perfect mix of portability and power. The Junior doesn't have the Lunchbox's super high output capability, but it still puts out rich tone and a surprising amount of volume for a small amp only half the size and weight of the ZT Lunchbox amp (5 lbs! talk about lightweight!). Jazz players love it for mid-volume gigs, and it's great for recording and home use because it takes up almost no space, it's simple to use, and it sounds so much bigger than it is. With flexible controls that take you from warm and mellow to pure overdrive bliss, it's just an all-around fun amp. The Junior received a Premier Gear award from Premier Guitar magazine in 2012. In the review, Matthew Holliman wrote, "The size-to-volume ratio is nothing short of remarkable. There is a fantastic, tube-like warmth that you just don't hear in many solid-state rigs...I heard a character-rich set of overtones and each note had a pleasing roundness." Jake Kelly of American Songwriter wrote in his review: "I've had situations where this portable amp would have been the way to go without giving up any tone. Frankly, I've been lugging around too much amp." No matter what other amps you own, the ZT Junior is a must have, especially if you need a portable, battery-powered amplifier kit in your stable.